I was just wondering if you would mind posting a short example of the code and data format used to specify colours in the phylomorphospace function (e.g., to create the figure form the paper describing the packages)? 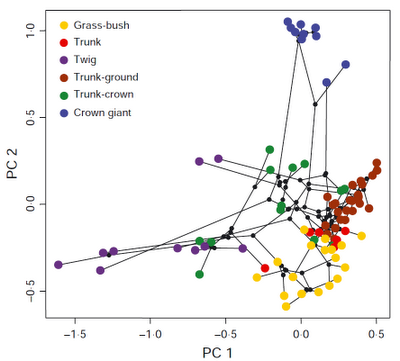 What this figure shows is a projection of the phylogeny of Caribbean Anolis ecomorph species into a two dimensional morphospace defined by PC 1 & PC 2 from the morphological dataset and tree of Mahler et al. (2010). 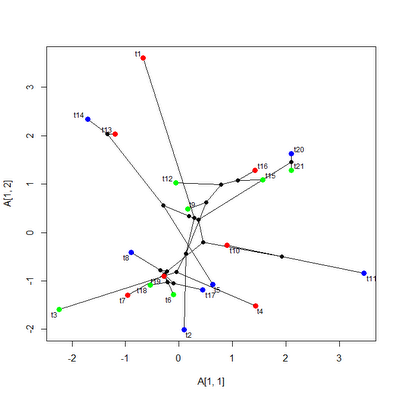 The tip nodes are colored by ecomorph category; and the internal nodes are black. If you examine this figure closely, you'll see that (as intended) everything third numbered tip node is colored red, blue, and green. 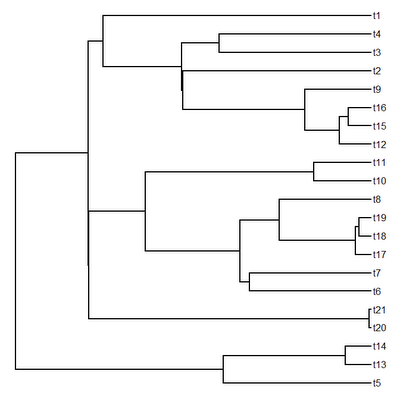 Obviously, with a real (rather than simulated) tree and dataset we would read in the states for the tip nodes from a file (and they would most likely mean something). It is important to both reorder the color vector by tree$tip.label and re-number it by node number. Don't forget to add elements for internal nodes, even if they are to be colored black (for now at least: perhaps I will fix this in a future version). 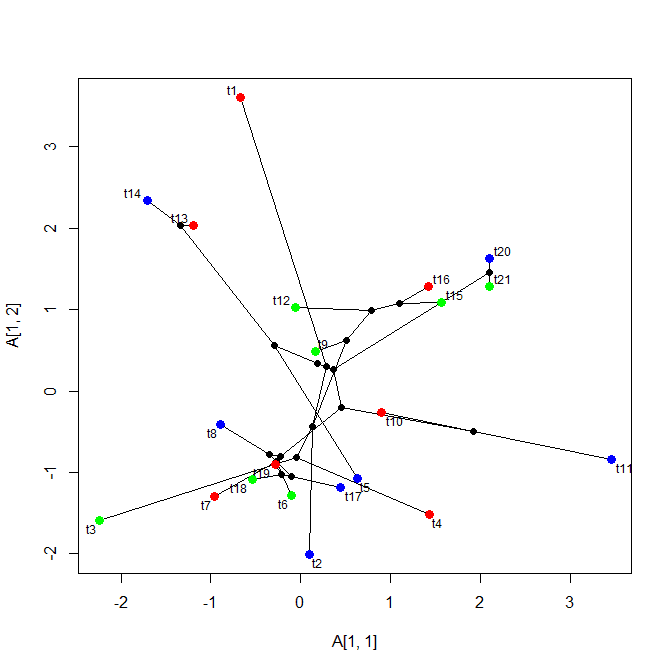 If we just want to color tip nodes, this is not difficult because the node numbers of the tips are 1 through N (for N species) in the order given by tree$tip.label. It is also probably a good idea to provide X as a matrix & control$col.node as a named vector, just to be safe. Is there a way to use getDescendents() to color the tips that descend from a certain node (including or excluding the node colors) to use in phylomorphospace()? 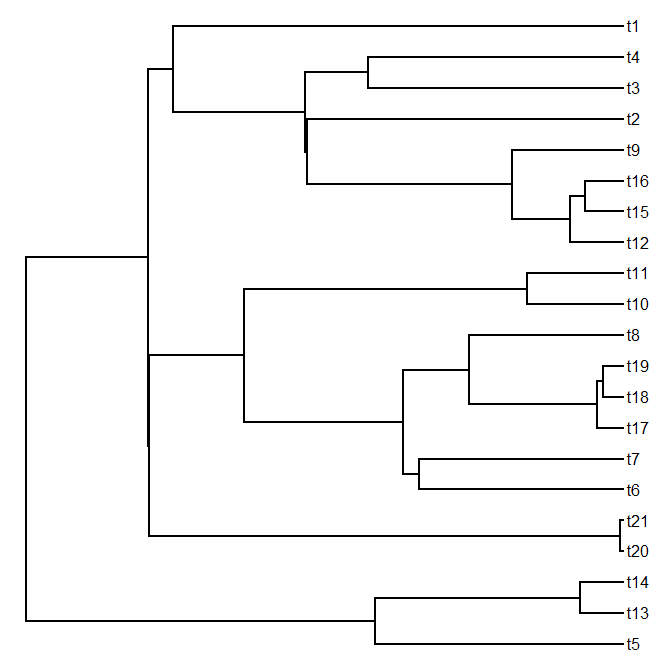 And if there are several clades one would like to color, how to use the objects of getDescendents for the different clades in the same phylomorphospace? I did try reading in the list as you suggested above but had no success. Works perfect! I tried the phenogram with tidy labels and also works perfect. Terrific. Glad to hear it. Can you post which version of phytools you are using (check with packageVersion("phytools")). There is a known bug in the latest CRAN release (described here), but I don't know of any problems (yet) in the most recent non-CRAN version (phytools 0.2-64). Thanks! Also - there is a newer CRAN version of phytools. I can't seem to find a newer Windows version of phytools than 0.2-50. I'm sure this is the same issue someone identified a few weeks ago (somehow I missed it in the blog). that did the trick, thanks for the advice.